In this fourth installment of the blockbuster series, time is running out as war between the Olympians and the evil Titan lord Kronos draws near. Even the safe haven of Camp Half Blood grows more vulnerable by the minute as Kronos’s army prepares to invade its once impenetrable borders. 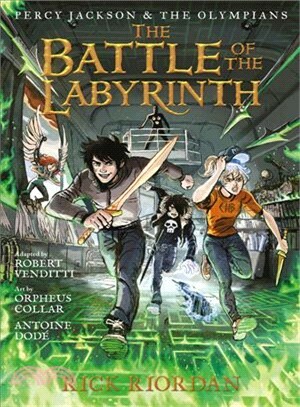 To stop them, Percy and his demigod friends will set out on a quest through the Labyrinth—a sprawling underground world with stunning surprises at every turn. Full of humor, heart-pounding action, and stunning illustrations, this thrilling adventure is a must-read for Percy fans! Rick Riordan, dubbed "storyteller of the gods" by Publishers Weekly, is the author of five New York Times #1 best-selling series, including Magnus Chase and the Gods of Asgard, based on Norse myths. He is best known for his Percy Jackson and the Olympian books, which bring Greek mythology to life for contemporary readers. He expanded on that series with two more: the Heroes of Olympus, and the Trials of Apollo, which cleverly combine Greek and Roman gods and heroes with his beloved modern characters. Rick also tackled the ancient Egyptian gods in the magic-filled Kane Chronicles trilogy. Millions of fans across the globe have enjoyed his fast-paced and funny quest adventures as well as his two #1 best-selling myth collections, Percy Jackson's Greek Gods and Percy Jackson's Greek Heroes. Rick lives in Boston, Massachusetts, with his wife and two sons. For more information, go to RickRiordan.com, or follow him on Twitter @camphalfblood. Robert Venditti is the New York Times best-selling author of The Homeland Directive and The Surrogates, as well as The Surrogates: Flesh and Bone. He also adapted the New York Times best-selling The Lightning Thief, The Graphic Novel; The Sea of Monsters, The Graphic Novel; Titan's Curse, The Graphic Novel and Blue Bloods: The Graphic Novel. In 2012, he launched the critically acclaimed ongoing comic book series X-O Manowar. He lives in Atlanta, Georgia. Learn more at RobertVenditti.com. Antoine Dod is an award-winning illustrator for his graphic novel work, including Armelle et l'oiseau. He studied illustration in Brussels at St. Luc Institute and has illustrated numerous comics and graphic novels, including the miniseries The Crow, Curare written by James O'Barr. 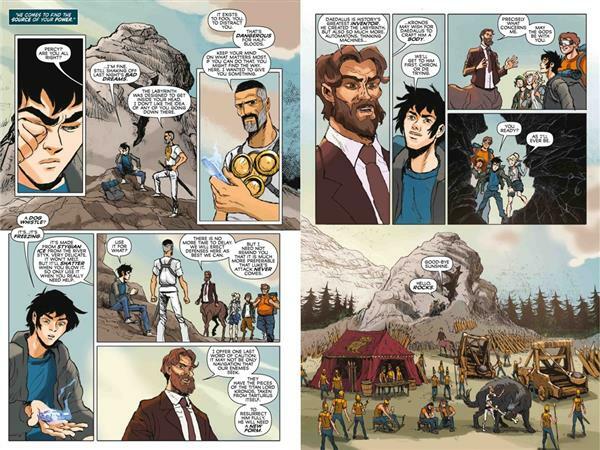 Orpheus Collar is a New York Times best-selling graphic novelist and illustrator. He adapted, illustrated, and colored The Red Pyramid, The Graphic Novel, a New York Times best seller, and The Throne of Fire, The Graphic Novel. He also drew layouts for The Lightning Thief, The Graphic Novel and has contributed his coloring skills to numerous titles, including The Lost Hero, The Graphic Novel; The Amazing Spider-Man and Ultimate X-Men. Orpheus lives in Los Angeles, California. Learn more at Orpheusartist.com.